Greifensee, Switzerland. 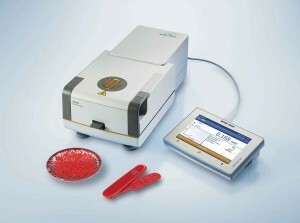 30 January, 2014 – The latest models of Professional moisture analyzers from Mettler-Toledo feature USB, Ethernet and WLAN connectivity for easy data transfer, and now can send measurement reports in A4 or letter format direct to a networked page printer. In addition to the outstanding connectivity, the built-in instrument tests are easy to perform and ensure accurate results. With a five-click guided procedure, the performance of all the instruments together can be qualified thanks to the certified reference substance SmartCal™. Besides outstanding measurement performance, ease-of-use is paramount be it in the laboratory or on the production floor. For example, Victorinox, makers of the legendary Swiss Army knives, adopted a Professional moisture analyzer in its production quality control process to check the plastic granulates used to mold components of the company’s products. Thanks to the factory automation, and in particular the use of an Professional moisture analyzer equipped with the OneClick™ user interface, only one non-specialist worker is required to run the entire molding operation. Victorinox quality control experts have pre-programmed the equipment with six shortcut keys; one for each of the plastic granulates in use. This ensures that the operator simply has to load a sample and press its clearly labelled shortcut key; the assigned drying method then starts automatically. Measurement results, displayed by an instrument on the factory floor, can be sent directly to a regular A4/letter printer anywhere on the company network, for example in the quality control office. The same data may also be transferred to a file server as a PDF for on-screen viewing and electronic archiving, as well as in standard CSV or XLS format for interchange with laboratory and office software. Professional moisture analyzers are tested as with SmartCal to verify the performance of the instrument’s overall functionality. After following simple instructions, normalization for ambient conditions is automatic thanks to a new plug-in humidity and temperature sensor. Reports are generated in A4 or strip printer format as well as PDF or CSV files. The goal at Victorinox is ensuring that materials are matching the quality requirements at goods receipt and during the production process. Since the Professional moisture analyzer went into service the company has been able to eliminate product errors and to speed up the molding process by as much as five to ten percent.